Cheltenham Gold Cup winner Lord Windermere heads 98 entries for the Grand National at Aintree on 11 April. Trainer Jim Culloty also has stablemate Spring Heeled as a contender for the £1m contest. 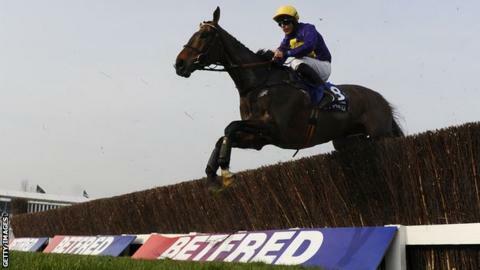 Victory would make Lord Windermere the first horse for 40 years to complete the Gold Cup-National double. A maximum field of 40 contenders will line up for the race, with other possible runners including last year's 1-2 Pineau De Re and Balthazar King. Spring Heeled is rated as early 25-1 co-favourite for the marathon over more than four miles. Culloty, who rode Best Mate to three Gold Cup victories, won the National in 2002 on Bindaree. The National is a handicap race and the weights that each horse is set to carry will be announced on 17 February. If he lines up, Lord Windermere would attempt to emulate L'Escargot, who beat Red Rum in the National in 1975, having won the Gold Cup in 1970 and 1971.